PTSD is a condition that develops in some people who have experienced a shocking, scary, or dangerous event in their life. Either flashbacks, nightmares or fearful thoughts which involve reliving of the traumatic event. Avoidance of places, events, objects, thoughts or even feelings that are reminders of the traumatic experience. And ongoing negative thoughts, or feelings of guilt and blame or loss of interest in enjoyable activities. 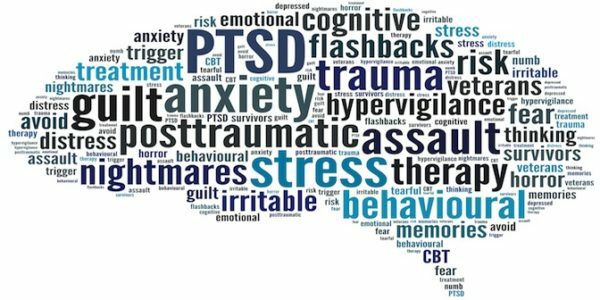 Statistics show that practically anyone can develop PTSD at any age including war veterans, children, people who have been through physical assault, or any form of abuse, people who have been through a traumatic accident, disaster, or any other serious event. According to the National Center for PTSD , about 7 out of every 100 people will experience PTSD at some point in their lives. Different factors play a part in whether a person will develop PTSD or not. If a person has support from other people, such as friends, family, or a support group and they have a positive coping strategy to help them get through difficult events, then they will tend not to suffer from PTSD, but if a person is constantly part of dangerous events and traumas or constantly sees other people getting hurt or dying while personally feeling helplessness and fear and this person has little or no social support after the event, and there may be additional personal stress from other aspects in life, then they will be more like to suffer from PTSD. Getting help and support for PTSD is the basis for recovery. Different therapies work for different individuals but one therapy will help anyone suffering from this condition, and that is lifestyle changes including nutrition. Our brain cells fire nerve impulses in specific neural pathways whether they be beneficial for us or not. Once trauma has taken place, our neurons re-live the event through persistent non beneficial thought patterns. Once our brain is conditioned to fire through specific neural pathways it needs external intervention in order to help change those pathways and create new ones. Behavioural modification therapy helps create new thought patters, and over time these new thought patterns will, for the most part take over non beneficial thought patterns. However, in order for the brain to be responsive to any kind of therapy it must be in a healthy state. The brain must get the right nutrients that it requires in order to be in a receptive state to accept neural pathway modification through therapy. Our brain needs specific nutrients that will help it heal itself. Our brain also requires that we take specific actions that will ensure optimal brain functioning. So, with that said, we shall now go into the specifics and I shall help you get your brain into its most optimal condition in order for behavioural strategies and other therapies to easily help you create new thought patterns that will get you out of focusing on a traumatic event and instead into focusing on the positive side of the situation. You still have a life to live and that life is in the present, not in the past. Once you create a nourishing environment for your brain cells it will be easier to focus on the good sides of your story, and gratitude will take over the negative feelings. This is a process which takes time and to ensure it happens in the fastest possible way, your lifestyle habits should support this process. In this video I will focus on nine dietary and lifestyle habit changes that, once changed they will help your brain to function at its best and even help create new brain cells that can be programmed to help you thrive rather than suffer in life. This action is so important to brain function and to feeling good. Complex carbohydrate rich foods have a very positive effect on brain health and memory due to the fact that during complex carbohydrate digestion, our body forms glucose which supplies brain cells with fuel, but the body also forms glycogen from the excess complex carbohydrates. Glycogen can be quickly converted back to glucose when the brain or body needs energy, and carbohydrates are not immediately available from food making glycogen a source of fuel available for our brains immediately when needed. But glycogen is more than just a storage of energy available for use in emergencies in our brain. It has been found that glycogen in the brain is a dynamic molecule having many beneficial consequences on brain cell function and memory. We have a very limited and low capacity to store glycogen. Therefore, having a regular source of complex carbohydrate foods in our diet increases glycogen levels and enhances brain function and memory whereas not consuming enough complex carbohydrates can lead to glycogen depletion and lowered brain function. Foods such as refined carbohydrates including white bread, white pastas and white rice, provide immediate but only temporary mood uplift. These foods are low in nutrients and actually reduce mineral stores in order to allow for their metabolism. By consuming complex carbohydrates such as wholegrain cereals, whole grain pastas, and brown rice, etc you are more likely to have a prolonged mood elevating benefit due to the positive association between the amino acid tryptophan and mental health. How does this happen? The amino acid Tryptophan is the least abundant amino acid to come by. Tryptophan is converted into serotonin, which when increases in the brain , it reduces symptoms of depression and contributes to feelings of well-being and happiness. When we consume a protein rich meal (such as a hamburger, or steak), tryptophan is the last amino acid to cross the blood brain barrier. It has to wait its turn after the more common amino acids enter. But when eating a whole grain carbohydrate rich meal with sufficient protein tryptophan is available for the brain because when carbohydrate rich foods are consumed, the body releases insulin, which diverts other amino acids to the muscles but leaves tryptophan untouched. This provides a better ground for tryptophan to enter the brain and promote its nourishing effect on the brain. On the other hand, consumption of an average amount of alcohol has been shown to decrease tryptophan by about 25%, leading to a similar decrease in serotonin. So you want to increase tryptophan rich foods in your diet and these include: Spirulina, chia seeds, sesame seeds, watermelon seeds, flaxseeds, cashews, pistachios, almonds, potatoes and soya beans. Our brain is comprised of 75% water and it needs regular rehydration since our body cannot store water. Our brain must be well hydrated in order to function properly. When the brain is not receiving enough water it will dehydrate. Symptoms of dehydration include headaches, feeling tired, mood changes, slow responses, and confusion which all exasperate symptoms of PTSD. So, How Much Water Is Enough? To calculate the amount of water you need to consume a day, just multiply your weight in kilograms by 0.14 and you will get the amount of cups of water you need to consume daily. But, what about the water source? Will any water do? The answer to that is a straightforward NO. High levels of chlorine used to disinfect water and fluoride used to stop dental decay are all found in tap water and can disrupt brain function. The best way to avoid any health interference from water is to ensure you have a good water filter at home or to consume pure spring water. Water filters are available for any pocket and do the job of ensuring you have a clean and steady water supply awaiting you. When water is easily accessible, you will find that you tend to drink more. It is also important to mention the importance of focusing on the right beverages for optimal brain functioning. Pure water is the best of course but also caffeine free pure herbal teas, and no more than two cups of freshly ground coffee a day are other options. Anything other than these beverages should be avoided. Soft drinks in particular. When drinking water, rather than any other beverage, you are satisfying your water needs without adding any energy in the form of calories to your diet, and without adding chemicals in the form of artificial sweeteners. Artificial sweeteners such as aspartame (Nutrasweet) can actually damage your brain cells. Consuming a lot of aspartame may inhibit the ability of enzymes in your brain to function normally. High doses of this sweetener can lead to neuro-degeneration. It is good to mention also that water actually helps remove waste products from our cells and transports important nutrients into them. Water cleanses and rids our body and our brain of toxins and keeps our brain and body functioning at their best. #3 Remove All Processed Foods From Your Diet. I agree that processed foods are delicious. They are intently made so through the use of food science, brain science and evolutionary science which make these foods as tasty and addictive as possible. Our limbic brains are attracted to sugar rich, fat laden and, salty foods because these are the foods that ensured our body and our brain’s survival. Processed foods with these ingredients send signals of reward to our brains giving us immediate pleasure and make us crave for more. But these foods actually wreck on your mood. Food has a direct impact on our mood and the wrong foods can spiral you into real depression. You want to start to gradually removing processed foods from your diet. You can start by reducing salt and sugar. It’s not easy to reduce salt or sugar intake, but the real cravings for these foods last less than a week after you begin to reduce their intake, and then your taste buds will soon follow suit. Where is salt found? Not only in the salt shaker, but also in all of the processed foods in high quantities and in different forms. Salt adds strong flavour while also acting as a preservative. High quantities of salt have been associated with many diseases including stroke, cardiovascular disease, high blood pressure, and stomach cancer but it also dehydrates our brain cells reducing brain function. The best way to reduce salt consumption is to replace it with vegetable salt which is made from natural vegetables that have a higher sodium content. These include: celery, kale and seaweed. You also want to reduce sugar consumption. A diet high in sugar can raise inflammation levels throughout the body and the brain—and now research is tying inflammation to higher incidences of depression. By lowering your levels of chronic inflammation through the reduction of plain sugar in your diet, you will, in turn improve your mood. Where is sugar found? Pretty much everywhere. Since most of us love sugar or salt, these additives are added to almost all unnatural and processed foods. Sugar is added to your morning coffee or tea, your breads, meats, breakfast cereals, jams, cookies, candies, ice cream, condiments like ketchup and in all ready made meals, and may even be sprinkled by you on certain foods. Sugar is also found in most beverages including fruit juices. It is incredibly abundant in our everyday diet where it damages the liver, leads to hormonal imbalance, raises cholesterol levels, leads to high blood pressure and is a risk factor for heart and kidney disease. I recommend you start reading food labels before buying and consuming any food. There are so many additives and flavourings added to foods that make them look, taste and feel different from what they really are. Now I want to make this point clear, by reading the food labels I do not mean to read the calorie content or the fat or protein content on the label. No! I mean reading the ingredient label. When you start reading food labels you’ll be surprised to learn how many unnatural ingredients are in your food that wreak havoc on your health and research published in the British Journal of Psychiatry which looked at more than 3,000 people, found that those who ate the most processed foods faced increased risk of suffering from depression, while those who ate the most whole foods had much lower odds. Consume plenty of fresh fruits and vegetables due to their high levels of antioxidants which are required to protect brain cells from free radical damage that is caused by many factors including stress and even negative thinking. Specific antioxidant rich foods have been shown to reduce excessive accumulation of free radicals in the brain. Brain cells have a naturally high risk for oxygen damage and they require special antioxidant protection at all times. Consume different types of fruit and vegetables to ensure a variation of antioxidants. Consume fruits and vegetables of different bold colours. This will ensure that you get plenty different types of antioxidants through your diet to support and protect your brain. # 5 Get plenty of sleep. You need sleep as much as you need to breathe and eat. Sleep deprivation leaves the brain exhausted, so it can’t perform properly. While sleeping your mental energy is restored, and a lack of sleep may even cause your brain to stop producing new cells. Deep sleep triggers the body to release growth hormones that promotes normal growth and helps in the healing and repair of cells and tissues in people of all ages. Getting enough sleep is vital for healthy brain function. When you’re deprived of sleep, your brain can’t function properly, affecting your cognitive abilities and emotional state. It was proven that sleep deprivation has a more powerful effect on the clarity of thought and on the rate of reaction than alcohol consumption. Normal sleep is a restorative state. The immune system relies on sleep to remain healthy. Ongoing sleep deficiency changes immune system function reducing immunity and increases the risk for developing chronic illness including mental illness. If you are serious about improving your mental health, the first step is simple. Get enough sleep at night. Omega 3 Polyunsaturated fatty acids are important for the brain. They play a critical role in brain function and mood. Omega 3 fatty acid deficiencies are linked with depression and other mental health conditions. These are essential fatty acids, meaning that the body can’t produce them. We must consume these essential fatty acids from our diet. The healthiest form of these fatty acids come from foods including chia seeds, flaxseeds and walnuts. These fatty acids keep the dopamine levels in your brain high, increase neural cell growth in the frontal cortex of your brain involved in thinking, and increase blood flow in the brain. Make sure you are consuming these foods on a regular basis. Specific forms of exercise encourage the brain to function at optimum capacity by causing nerve cells to multiply, strengthening their interconnections and protecting them from damage. Exercise increases the production of brain derived neurotrophic factor (BDNF), which is a member of brain growth factors. BDNF is one of the most active brain growth factors and acts on specific neurons supporting their survival and encouraging new brain cell growth and helps create new neural networks. BDNF is very important in helping us to form new behavioral patterns. There are several ways to increase BDNF in the brain including the dietary guidelines that I am mentioning here and also endurance exercise such as walking or running. I truly recommend incorporating at least 3-one hour blocks of walking into your weekly routine in order to increase BDNF production which supports brain cell growth, creation of new neural pathways and protection of existing brain cells. #8 Getting out into the sun. This will help you maintain optimal vitamin D levels. There are vitamin D receptors in the brain, spinal cord, and central nervous system and Vitamin D is involved in maintaining the health of your brain. There is even evidence that vitamin D helps your brain get rid of certain toxins. Vitamin D deficiency is very common in the western world. Most of us are not getting enough sunlight. Vitamin D deficiency is linked to mental disorders, and depression. Try to reveal a small part of your skin to direct sunlight for at least 10 minutes a day. If this is not possible for you, then I sincerely suggest taking Vitamin D3 supplements. #9 Reducing Your Amount of TV Viewing. Television affects our brain chemistry and allows our subconscious mind to accept information without having any guard over what enters our mind and what not. This is a highly unrecommended activity and I would recommend reducing television viewing to no more than one hour a day. The shows created today are luring because they play on our fears and increase them. Television commercials are made to psychologically brainwash us. If you want more control over your health, your brain function and your life overall, I would suggest limiting passive television viewing. This may seem like a drastic step, but once you do it you will be thrilled by the new activities you will have the time to take part in that will enrich your life. #1 eat wholegrain carbohydrate rich foods throughout the day such as whole wheat pasta, brown rice and wholewheat breads. #2 Drink plenty of water in little amounts throughout the day to ensure brain hydration. #3 Remove all processed foods from your diet especially sugar, salt and chemical rich processed foods. # 4 Consume plenty of fresh fruits and vegetables for their high levels of antioxidants that protect the brain from free radical damage. # 5 Get plenty of sleep to ensure your hormones are balanced. #6 Consume Omega 3 fatty acid rich foods which are important for brain function including chia seeds, walnuts and flax seeds. #8 Get out into the sun for vitamin D which prevents depression. #9 And reduce the amount of TV you are watching on a daily basis. I hope this has helped you and you now understand the influence food choices have on mental health. I am wishing you all the best, and may you find the path to health and happiness and find your bliss for the world needs your gifts!